Anderson Ford Motorsport remains a trusted provider of high quality and affordable 03-04 Cobra Terminator performance parts in Illinois. We have everything for the Mustang enthusiast. 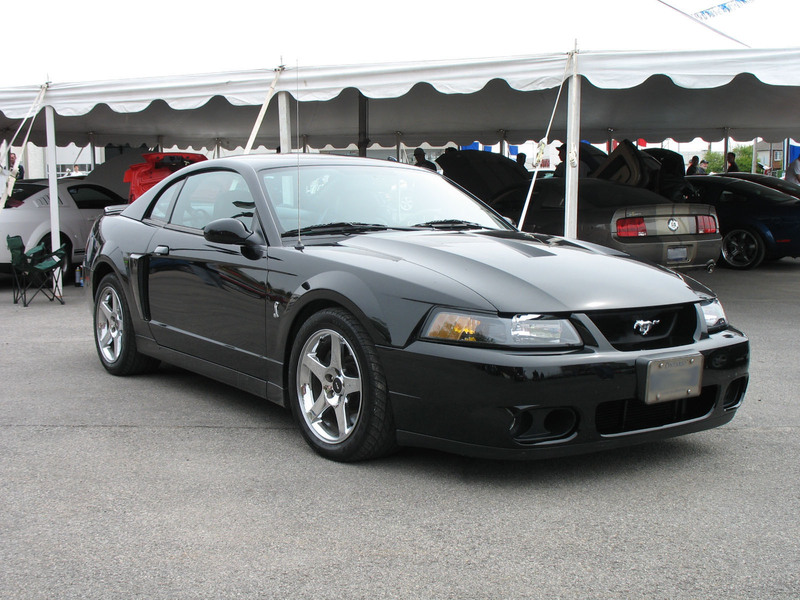 Are you planning to upgrade, rebuild, or replace some parts or systems in your 03-04 Mustang Cobra? Perhaps you already have a list of items you need, but don’t know where to get them. You’ve found the right place. Anderson Ford Motorsport is here to satisfy your desire for increased power and improved handling, comfort, and performance. We’ll help you find the right combination of parts and provide the tuning service necessary to make everything work as expected. BBK Performance cold air induction system for 2003 - 2004 Mustang Cobra. Chrome finish. Like anything forced induction, getting more power is as simple as changing the supercharger's drive pulley to add boost. Of course, there are limits to what the stock system can handle, making a simple pulley swap turn into an engine rebuild. You need the right parts and professional advice to ensure a successful upgrade. When you want to get more power out of your Cobra reliably, look to Anderson Ford Motorsport. We've been working on Mustangs since the Fox body era, and we carry the parts that we know will work to get more performance from your Mustang from PCM flashers to retune the fuel system, methanol injection systems to keep knocking in check, and suspension components to keep that extra power from turning your track car into a drift car. From the start, SVT's Cobras were built to give buyers a mixture of performance and comfort, adding a lot of minor modifications to turn the Mustang into a more well-rounded performance car. That changed with the '03 Cobra. After a year of absence, this new car, developed under the codename "Terminator," added forced induction to turn the car into a monster. The '03 and '04 Cobras are powered by a DOHC 4.6-liter engine like their predecessors, but this engine adds an Eaton M-112 supercharger, maxing out at 8 lbs. of boost. The motor uses an iron block, forged pistons and H-beam connecting rods with wrist pin oiling holes to give it the strength needed to handle the added air. Although officially rated at 390 hp and 390 ft-lbs. of torque, actual output of production models is somewhat higher. An aluminum flywheel transfers power to a beefy 6 speed Tremec T-56 manual; no automatic was offered. Automotive magazines of the time clocked the car doing 1/4 mile times in the mid 12s, about a second faster than the naturally aspirated Cobras. The supercharged Cobra retained the independent rear suspension used in previous years, adding stronger half shafts and longer control arms help get all that new power to the ground. Because the rear wheels can move independently, IRS helps the rear tires stay on the ground when passing over bumps, making it a great choice for track and street-focused cars. In the past, drag racers would swap it out for a solid axle to reduce wheel hop, but aftermarket parts can turn the stock axle into something that works as well on the strip as it does on the street. The exterior also got some minor changes, adding brake ducts and hood scoops to keep the car cool. SVT celebrated their 10th anniversary with a special package on the '03 Cobra that added unique trim pieces, and the MystiChrome paint option was offered the following year to celebrate Ford's 100th anniversary, but these cars were left untouched mechanically. Production at the Dearborn Assembly Plant was near its end, which resulted in production being cut in half for the '04 Cobra. Anderson Ford Motorsport takes you closer to finding the best Mustang Cobra parts on the market. Place your order today and we’ll have it shipped to your place as soon as possible. Better yet, drive straight to our service center in Clinton to get professional assistance. Our technicians will help you choose the right performance parts for your Cobra Terminator. If you prefer shopping for Mustang parts online, check our list of products and browse by category to narrow down your options. Contact us for your inquiries or concerns.